Aged 14, Kagamine Rin has a mirror image (can be seen as twins or lovers), Kagamine Len. As a character from the second installment of Crypton's Vocaloid Character Voice Series, she is voiced by Asami Shimoda. 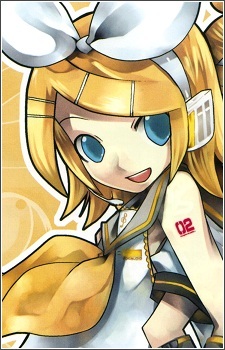 Released on December 27, 2007, Kagamine Rin/Len is the second installment of the Vocaloid2 Character Vocal Series. Their family name was chosen by combining "kagami" (鏡, mirror), "ne" (音, sound), with the first syllables of their given names a pun on "left" and "right." They can be portrayed either as twins or reflections depending on the person viewing them or the song(it is not officially stated). According to Vocaloid's official blog, the package includes two voice banks: one for Rin and another for Len, both provided by the voice actor Asami Shimoda. Despite the double voice banks, the package still sells at the same price as Hatsune Miku. Their only cameo appearance in an anime is in (Zoku) Sayonara Zetsubō Sensei, where the two and Miku (and various other people and characters) try out to be the voice of Meru Otonashi.